For anyone who’s read about my pork shoulder from the other evening, it should come as no surprise that I’m recycling leftovers (happily) tonight. I have a large amount of roast in braising liquid left, and all weekend long, I’ve been looking forward to a bowl of pasta dressed with it. To make a sauce out of the roast, the meat gets shredded in its braising liquid–either pulled apart with 2 forks when the meat is hot, or simply passed through the food processor and pulsed a bit to form a chunky sauce. 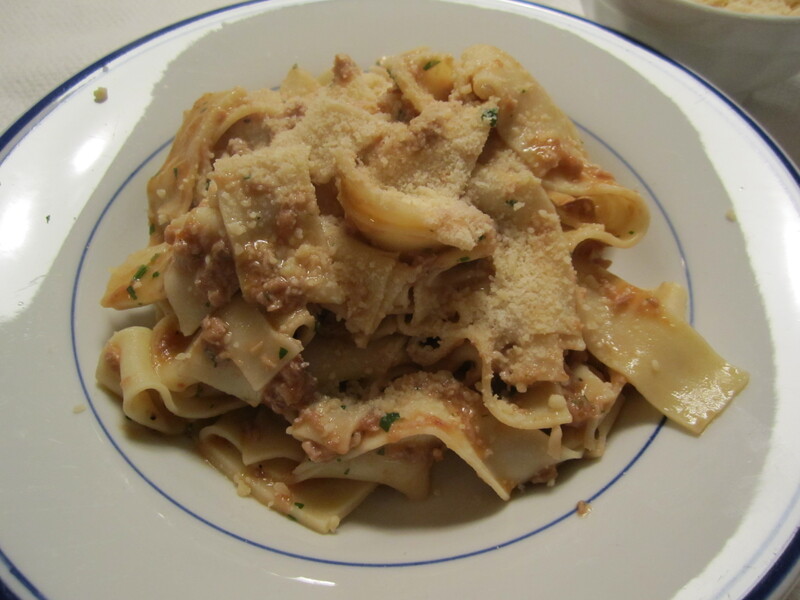 I have some pappardelle in the freezer, which are the perfect noodles on which to serve this sauce. People often overestimate the amount of sauce it takes to properly dress pasta. It takes very little sauce to coat the pasta but not weigh it down. A well-dressed dish of pasta should strike a balance between sauce and pasta. In this case, for a pound of pasta (to serve 4), use only about a cup of sauce. Another necessary step in turning this roast into a sauce is to reduce the ragu a bit and add some fat to it, to turn it from a watery stew into a rich sauce. Therefore, while the pasta is cooking, place the shredded meat sauce in a broad skillet and let it simmer uncovered and reduce for about 5 to 8 minutes. Add some olive oil or butter (or both) to it while it’s reducing. When the pasta is cooked, simply toss it into the skillet with the sauce and add a bit of pasta cooking liquid and toss for a minute over the flame to incorporate. At the table, add lots of grated cheese (a combination of parmiggiano and pecorino would be nice). I’ve made a salad of arugula, shaved fennel and tomatoes, and dressed it with olive oil and red wine vinegar. That’s all that’s necessary to turn some leftover roast into a truly phenomenal meal.